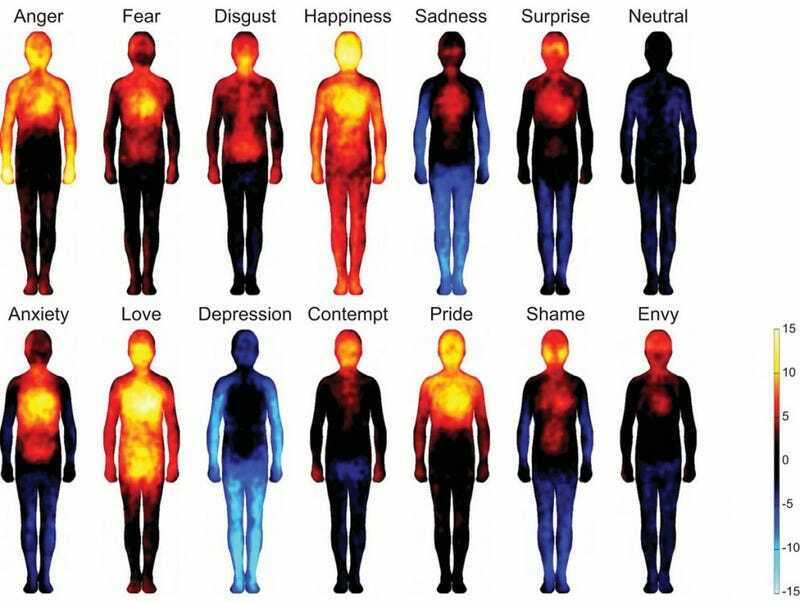 Emotions are as much physical as they are mental, and it appears that people from a wide range of cultures feel their emotions in the same places on their bodies. This map shows where those places are — from the blush of shame, to that warm lower-belly feeling in love. More than 700 participants in Finland, Sweden and Taiwan participated in experiments aimed at mapping their bodily sensations in connection with specific emotions. Participants viewed emotion-laden words, videos, facial expressions and stories. They then self-reported areas of their bodies that felt different than before they'd viewed the material. By coloring in two computer-generated silhouettes — one to note areas of increased bodily sensation and the second to mark areas of decreased sensation — participants were able to provide researchers with a broad base of data showing both positive and negative bodily responses to different emotions. It's important that the researchers sampled such diverse populations, because that helps to eliminate cultural biases in how people interpret their feelings. Particularly remarkable is the way some emotions look similar, such as pride and anger. Also, you'll see that love is the only emotion (other than happiness) that includes a warm glow between the legs — wonder why that might be?